Situated on the Asian side of Istanbul in a 950,000m² area, Teknopark Istanbul will host around a thousand local and foreign research and development laboratories. To enhance the appearance of the first building at Turkey’s largest technology park, architectural team Bütüner Mirmarlik from Ankara chose HAVER & BOECKER architectural wire mesh for the facade cladding. A total of 2,700m² of architectural wire mesh and an additional 52.5m² of IMAGIC WEAVE® transparent media façade were used to embellish the building. IMAGIC WEAVE® offers the right solution for every project. Due to the vast range of stainless-steel wire meshes, various LED pitches and two different LED technologies available, IMAGIC WEAVE® media façade can be optimally and individually adapted to suit any project. 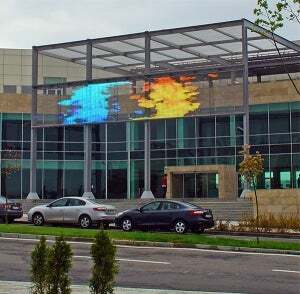 At Teknopark Istanbul, IMAGIC WEAVE® HO media façade system is used with an LED pitch of 40mm x 78mm together with architectural weave type DOKA-BARRETTE 8920. IMAGIC WEAVE® HO is the combination of HAVER & BOECKER Architectural Mesh and THT LED profiles from Traxon Technologies. The excellent high-brightness of the THT LEDs of the IMAGIC WEAVE® HO system makes it suitable for daytime presentations. Slim LED-profiles are discretely attached to the reverse side of the architectural mesh, maintaining the homogenous appearance of the mesh façade at all times. The inconspicuous cabling of the LED-profile is not visible from outside and with a system transparency of 58% the view from inside the building to the outside is retained. In addition to weave type DOKA-BARRETTE 8920, 2,700m² of MULTI-BARRETTE 8123 cable mesh were installed. With an open area of 64%, the architectural mesh acts as a sun protection screen in front of the offices. For more information, please contact HAVER & BOECKER.